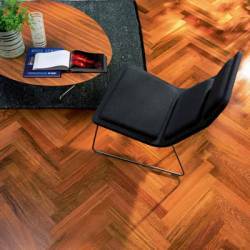 Herringbone hardwood floors, popular in Europe and Australia, are gaining popularity in the USA once again after a long absence. Trying to define exactly what a herringbone floor is much easier in pictures (shown right). Herringbone floors offer a unique style in that they are all identical lengths forming a distinct pattern. 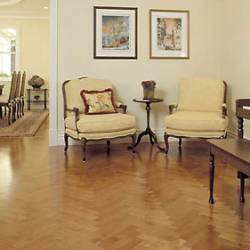 These types of floors are best left up to a professional for installation. Keeping the pattern or installation tight and aligned is critical. Without doing so, patterns will gap and lose their integrity. Products are milled at near perfection. 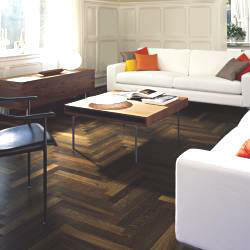 Some of the products we offer include Kahrs Herringbone called the Kahrs Studio Collection. 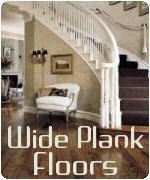 Specifications call for an engineered 2 3/4" wide by 18 1/2" length with a square edge board design in eight different hardwood species. Another words after installation, the floor will have a site finished appearance, without bevels or micro bevels. Mirage hardwood floors offers a herringbone line of 2 9/16" width by 13 3/4" lengths or 17 7/8 inches with several stained colors in Maple and Red Oak. Also engineered, the board design is a micron bevel, one of the smallest bevels in the industry.